The special Selvage fabric contains 42% hemp. Hemp fibers are relatively long - the material is therefore characterized by longer, visible crosshatches and Neps. The color of the fabric is irregular, ranging from deep blue-black to indigo. The two-tone stitching in yellow and classic Nudie jeans orange give this model 14 oz. Selvage denim an old-fashioned touch. Each piece is numbered and already today a popular collector's item. This product is part of the Indigo Bloodline collection. 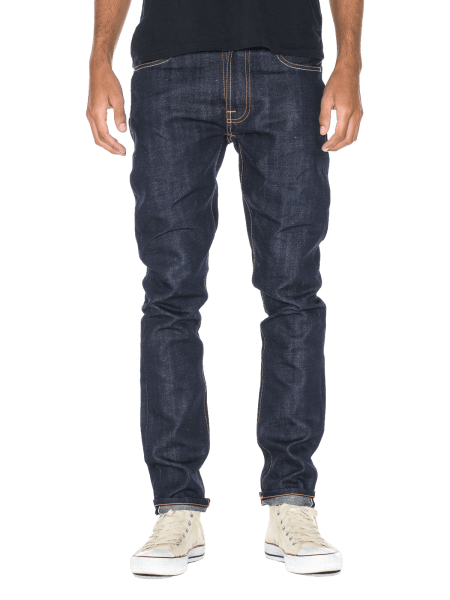 A Nudie limited edition selvage jeans made with 42% hemp. The hemp fiber is rather long, which gives the fabric longer, visible crosshatch effects and neps on the surface. This redcast fabric is irregular in terms of dye, which ranges from deep black-blue to indigo. Two-tone stitching in yellow and classic Nudie Jeans orange give this 14 oz. selvage option an old-timey look.